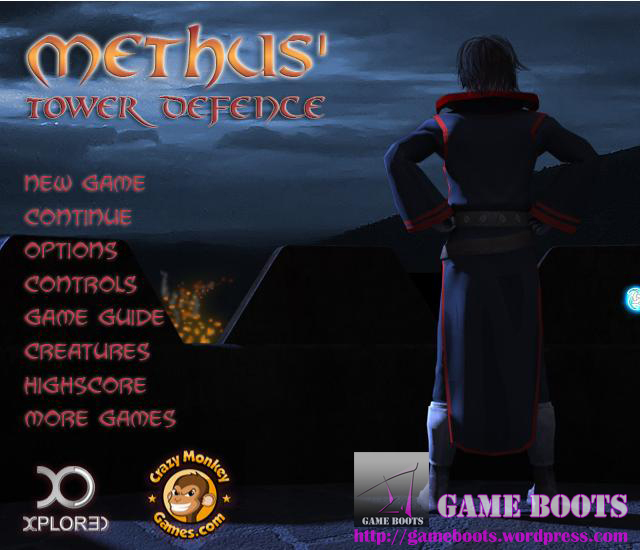 Methus Tower Defense, created by Explored and hosted at Crazy Monkey, is a shooting tower defense game where, instead of creating towers along your enemies’ path like the usual TD (Tower Defense), you aim and shoot at the enemies before they get to you or whatever it is you’re protecting. In this game, you are a wizard and you get to choose the spell you want to use provided you have enough mana to cast them. You also collect the souls of the enemies you defeated which you can use to upgrade or buy spells and even covert some souls to mana if you run out of it. Game Screen, instructions and controls. This is considered a strategy game and I like these types of games because there are a lot of spells to upgrade and choose from so there are a lot of ways you can beat this game, but of course, there’s always the best and easiest way. Also, the game offers a respectable degree of challenge and you’ll really want to finish the whole game and not stop halfway. This upgrade screen appears each time you complete a level. You can also recharge your "magic barrier" or health bar. After completing the game, I’m not motivated enough to play it again. And that’s because you’ll have to start from the very beginning where you don’t have the spells you upgraded, and the enemies are, well, weaklings. You’ll have to go through those boring levels first before you get to the challenging ones and have the arsenal of spells you like. I would also like to have speed control so that it’s faster to get through the levels or waves with the weaker enemies without spending too much time on the game. When I completed the game, I could no longer choose the “CONTINUE” option under the main menu. I thought that the “CONTINUE” option holds the latest game data that I have before finishing the last level, but it didn’t. I wanted to try the other spells and use it on the last level but it seems that I have to play the game again, from the start, if I want to do that. Ugh! 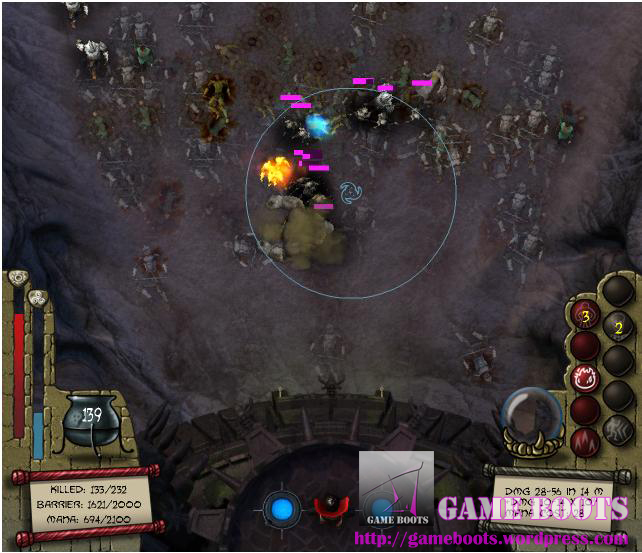 FIREBALL – Hits multiple enemies within the radius of the spell range (range improves when upgraded). RAISE DEAD – Maximum spell level 10 allows you to create upto 20 zombie minions to fight for you. For those struggling how to raise the dead and make zombies, choose this spell when you have souls in the field (don’t collect the souls). You’ll see on the screen the scope or range of the spell and all the souls within the range will be turned into zombies, upto the maximum limit depending on the level of your spell. 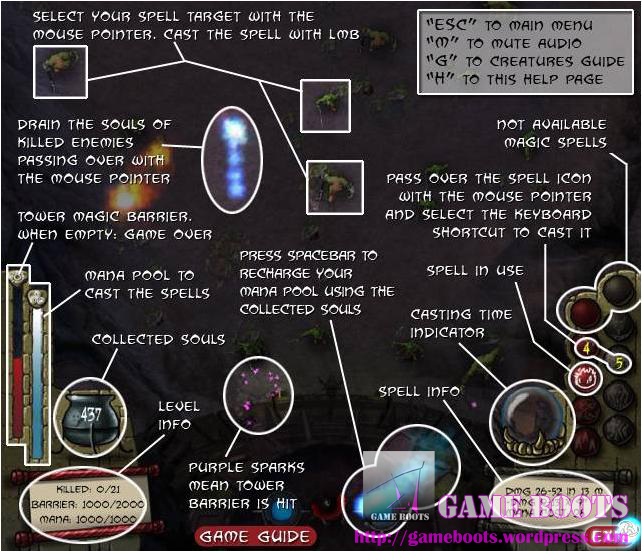 The more you level up this spell, the wider the range is (more zombies in one click – provided you have a lot of souls clumped up in a spot) and more zombies for you. 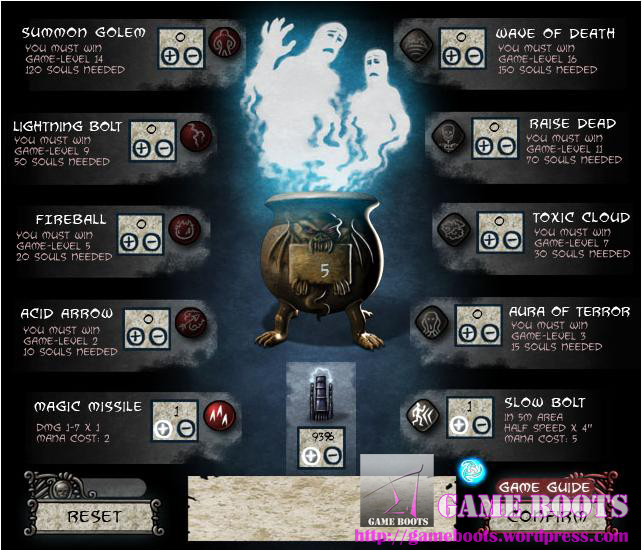 SUMMON GOLEM – Fights enemies that get too close to you. You can only summon 1 Golem though. WAVE OF DEATH – Hits all enemies on the screen. Best upgraded to 10 then use RAISE DEAD after casting this spell because there’s sure to be a buffet of souls to be converted to your own zombie minions. Here you can see my Golem and Zombies (purple health bar) fighitng the enemies for me. You can let them take care of the melee enemies but make sure to watch out for long-ranged ones. The Zombies are slow and the Golem is even slower. You'll take on damage if you don't take care of the archers and spellcasters yourself. Even though I listed more “DISLIKE” than “LIKE”, I think it was still a game worthy of my time and effort. I love a challenge and completing a game that offers a respectable degree of difficulty makes my day. 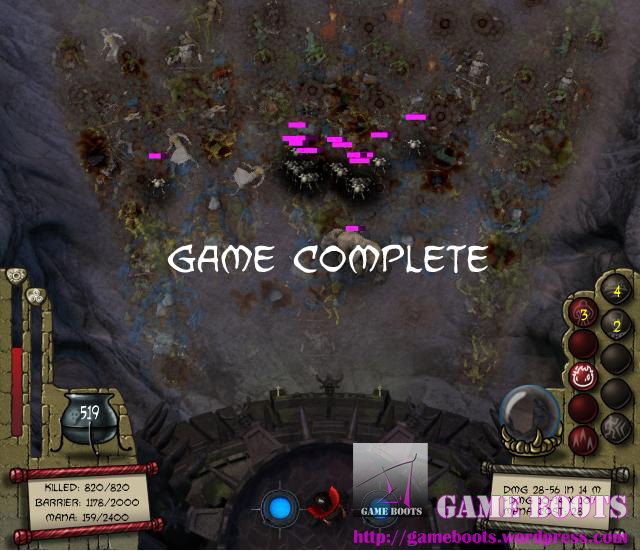 This entry was posted in Reviews, Strategy, Tips and tagged free games, game, high score, methus tower defense, online, play, review, strategy, strategy game, td, tip, tips, tower defense. Bookmark the permalink.